I see Nanos's wrap up poll (2,400 ) gives the Grits 39.1%. Could that put them into Majority territory? 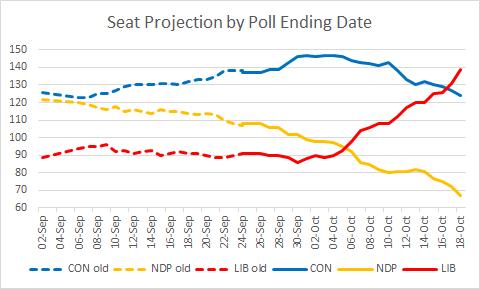 I note that Harper needed 39.6% to get a majority of 24 seats. Also, can I ask how your turnout adjustment worked in the Ontario election? I seem to recall that all the "likely voters" polls were wrong and that Frank was right on with his "all voters". Many thanks. Am very grateful for all your work. I like that Teddy on Politics is forecasting a Liberal victory in Victoria ... which doesn't have a Liberal candidate. 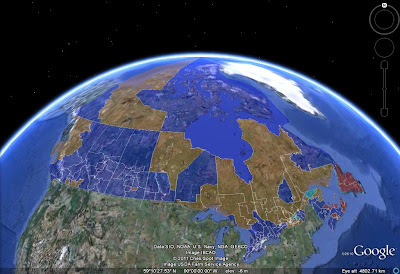 @Jeremy: Harper didn't "need" 39.6% - that gave him an 11-seat cushion. Probably 38.5% would have been enough for him. 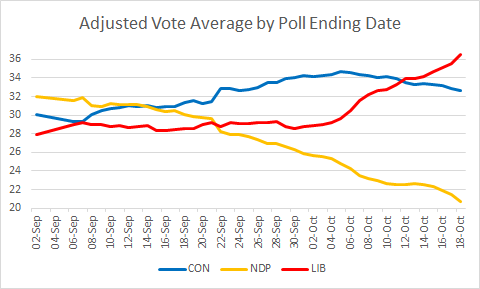 The Liberal vote is less efficient, so I think they do need to hit 40% for a majority (unless their opponents' vote collapses in the right places). @Anonymous: Awkward indeed... Also I'm very skeptical about the majority projection with that popular vote.